…a Radio Schedule, or a SKED. It is like the communications equivalent of a Rally Point or Disaster Meet-Up Plan. Turn on your radio. Every 3 hours. For at least 3 minutes. Channel 3. Synchronize your watch with other radio operators whenever possible. If you doubt your watch accuracy, compensate by keeping your radio turned on for a longer duration, before and after every 3rd hour. If you don’t have a watch, try listening to an AM broadcast radio station, they always identify their call letters at the top of each hour. Channel 3 is CB-3, FRS-3, or MURS-3. 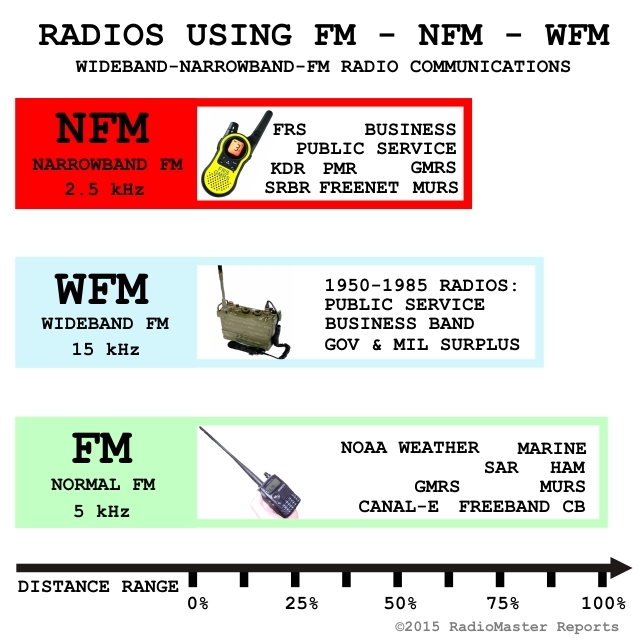 CB, FRS, and MURS are the most common types of radios used by survivalists and preppers. If your organized group has a different designated SHTF channel or Prepper SHTF HAM frequency, you should use it as your 3-3-3 channel. For example: 146.520 FM Simplex, Freenet 3, or PMR466-CH3. 2. Conserves precious battery life for walkie talkies. 4. Sets a schedule of 8 times per day to call each other. 5. Avoids impractical hourly schedules that can be a burden in real-life scenarios. 7. Three hours between contacts is enough time to rest in a survival situation. 9. 3-3-3 is fully interoperable and compatible with the alternative 3-2-1 plan. Ham radios don’t have channel numbers. They have frequencies instead. A channel is really just a specific frequency that has a purpose. Most hams use 146.520 MHz FM Simplex (No PL) as their 3-3-3 channel. Some organized Prepper Ham groups use 146.420 FM Simplex. Non-aligned Survivalist Hams use 146.550 Simplex as the Bug Out Channel (BOC) and 3-3-3. 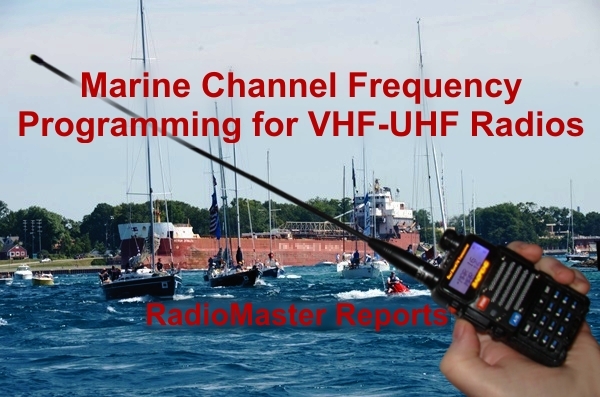 The most commonly used local ham frequency could become a 3-3-3 channel for your area. But it probably should not be a repeater channel, because repeaters may cease to function when SHTF! Instead, hams could use Simplex FM on the output frequency of the repeater. 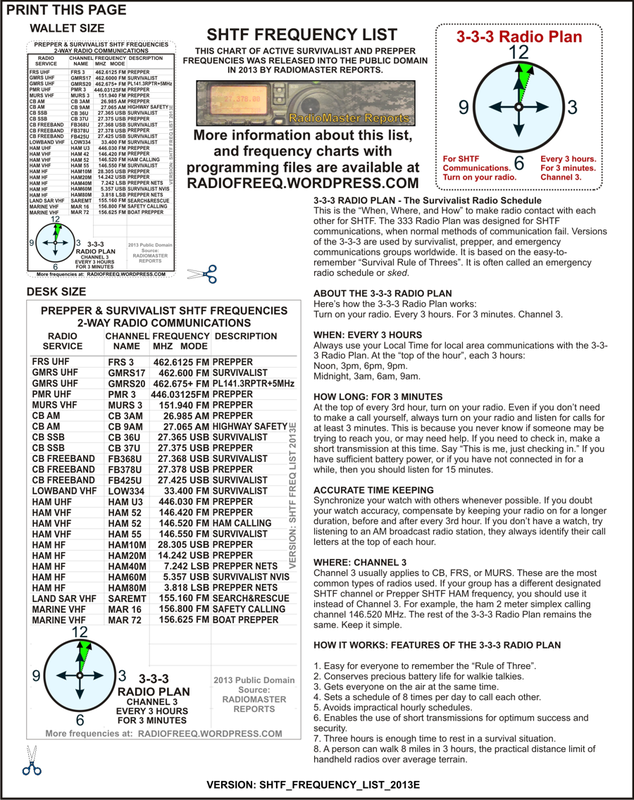 Feel free to copy, print, and distribute the 3-3-3 Radio Plan for your fellow preppers and survivalists. The 3-3-3 Survival Rule is a well known principle in survivalist training. It commits fundamental skills or procedures to memory. 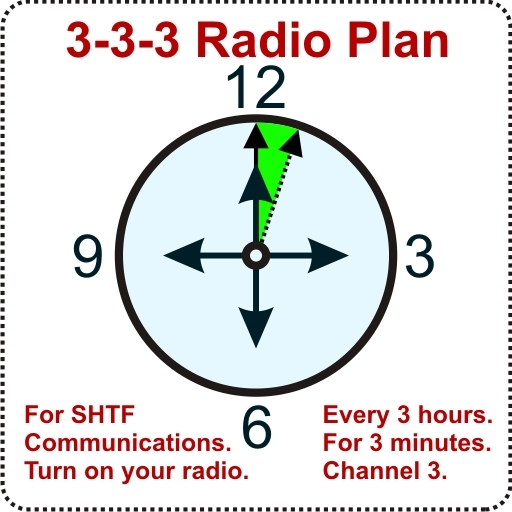 The 3-3-3 Radio Plan builds upon the Survival Rule of 3, otherwise known as the Rule of Threes. There is another new proposed alternative format going around among the prepper community called the 321 Plan or 3-2-1 Plan as part of a CH3 Project. The good news, is that the proposed 3-2-1 plan is fully compatible with the good old standard 3-3-3 Radio Plan. The proposed 3-2-1 Plan advocates an hourly schedule at the top of every hour! An hourly schedule is a fine ambitious plan in concept. It even looks pretty on paper, and it has a catchy name. It was proposed by well-meaning ham radio operators, bless their hearts. However, speaking from the voice of experience: No one who has ever been forced to keep an hourly schedule on the radio for days or weeks would ever advocate an hourly radio schedule. Especially if they had other responsibilities in life, such as eating, sleeping, working, or take care of family; much less existing in SHTF survival situations. Some argue that in an emergency situation, you wouldn’t want to wait more than an hour to reach someone. But, that argument fails to address the real point. No such radio plan should ever be considered the grid-down equivalent of calling 911. Those who want local radio comms among non-professional users to take the place of a professional emergency services call center, should really re-think their entire SHTF plan, because it is totally unrealistic. Don’t plan your preps on everyone listening and calling for you on your radio every hour, 24 times a day; it simply won’t happen, even with the best of intentions. The proposed hourly 3-2-1 schedule would eat up an HT radio battery within the first few days of SHTF. Compare that to 2 weeks of HT battery life using the 3-3-3 Radio Plan. That gives you some time to re-group and set up alternative resources. Unless you have a constant source of battery recharge power during SHTF, you won’t want to use up your precious battery with frivolous transmissions 24 times a day. 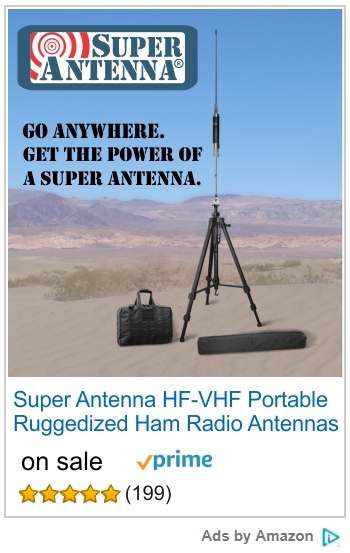 And, if you do have a constant source of power during SHTF, you might as well just leave your radio on all the time! What happens to the 3-3-3 Radio Plan if you or your contacts have lost track of the time of day due to watch or clock failure? One traditional alternative from HF commo circles is called the Sun-Based Radio Plan, and it uses a 3-times daily sunrise-noon-sunset schedule. The sun is the timekeeper. Each contact interval is a window of approximately an hour long, by your best estimation. Sunrise: The contact interval for sunrise starts slightly before the sun peeks above the horizon, and continues to your best estimate of 1 hour after it has risen completely. Noon: The contact interval for local sun noon starts when it is observed that the sun is highest in the sky. A small stick stuck in the ground straight up will have the shortest shadow at this time of day. It continues to your best estimate of 1 hour long. Sunset: The contact interval for sunset starts just before the sun starts to set and continues to your best estimate of 1 hour after it has set completely. Optional Night: An additional late-night schedule contact interval may be added, and this is normally estimated to about an hour or two hours after sunset. It may also be determined by the position of a specific star constellation, which is agreed upon in advance or by a radio message. If you are in a valley, a forest, or mountainous terrain, you must compensate and estimate your best guess of the actual sunrise and sunset. During inclement weather, the sun position is estimated, normally by observation of the color of the light. The Sun-Based Radio Plan is not effective at very high latitudes, such as above the Arctic Circle or in Antarctica. The Sun-Based Radio Plan is especially useful for HF (High Frequency) communications because it takes advantage of the natural daily changes in ionospheric reflection of radio waves. NVIS Near Vertical Incidence Skywave HF propagation peaks for certain frequencies at sunrise and sunset. It also is convenient for communication while traveling or camping, because the scheduled contacts at sunrise and sunset are normal in-camp times. The original source of this article is the RadioMaster Reports site. This entry was posted in high frequency, MURS, Survivalist Prepper Communications, UHF, VHF and tagged 123 plan, 3 3 3 radio, 3 3 3 radio rule, 3-2-1 radio plan, 3-3-3 plan, 3-3-3 radio plan, 321 plan, 333 radio, 52 simplex, amrron, cb radio, ch-3 project, ch3 project, Channel 3, comms, communications, emergency 52 simplex, frs radio, link up protocol, linkup protocol, prepper channel 3, prepper channel 4, prepper comms, prepper communications, prepper radio, prepper radio comms, radio plan, radio rule of 3, radio rule of three, radio sched, radio schedule, radio sked, redoubt, rule of 3, rule of three, SHTF, shtf comms, shtf communications, sun based radio plan, survival radio, Survivalist, survivalist frs, survivalist radio, survivalist radio schedule, wilderness 52 simplex, wilderness protocol. Bookmark the permalink. Awesome idea. Thanks I will pass this along to my group. Like a rally point, but on the radio. Cool. Sorry, but what specific channel is supposed to be programed into ‘Channel 3’? Channel 3 usually applies to CB channel 3, FRS channel 3, or MURS channel 3. These are the most common types of radios used by preppers. 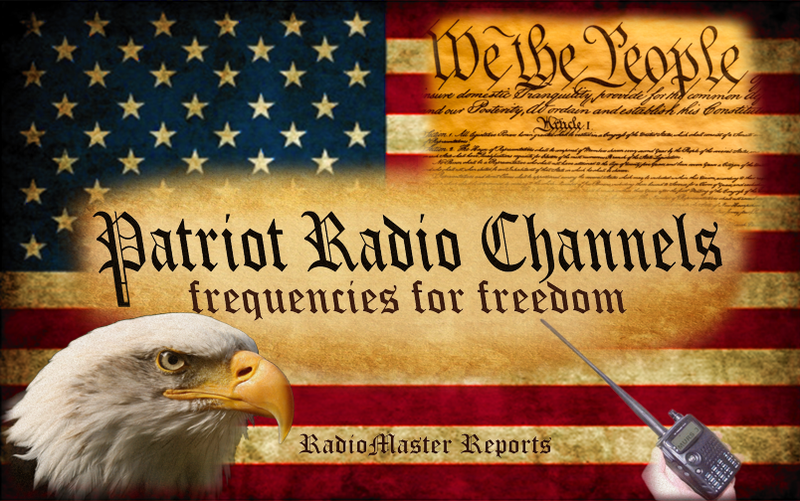 If your group has a different designated SHTF channel or Prepper SHTF HAM frequency, you should use it instead of Channel 3. The rest of the 3-3-3 Radio Plan remains the same. Keep it simple. Before SHTF, this concept could possibly be expanded in order to find other like-minded people in your immediate area. On the 3rd of the month, at one of the specified times, call on a frequency you are able to. Perhaps you’ll be able to strengthen your position by making some new local contacts! All groups need to start practicing this now to get more people involved, to know who is in your area, we are almost to the SHTF EVENT!